I guess you could say I’ve shown true dedication to the cause. With the chance of seeing and ‘experiencing’ the fourth and final art installation relevant to my dissertation and my art practice, I took a ‘day trip’ to Versailles. The reason for the trip was to see the work of Anish Kapoor, but more importantly his water vortex installation entitled Descension. Descension is an installation consisting of a whirlpool of inky black water that is set in the ground. The whirlpool is so powerful it creates a large vortex in the centre of the seven metre diameter pool. The first thing I noticed as I approached the installation was the noise. From about 200 metres away you can hear a deep rumbling, almost growling sound, but it’s not until I got closer that I realised the noise was coming from the whirlpool. As I got to within about three metres of Descension I could feel the ground vibrating, as was the barrier surrounding it. 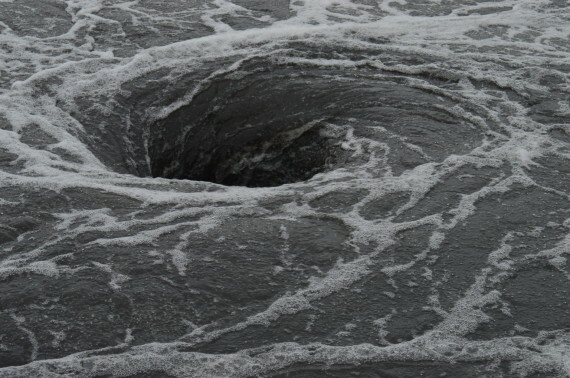 The thing that was far more imposing was the incredible sense of menace I felt as I looked at the large vortex that had opened up and appeared as a large hole with masses of black water being swallowed into the earth beneath. It made me feel very nervous of getting too close even though there was a barrier there. Almost hypnotic, it felt like it could easily draw you in had the barrier not been there. It did, however, keep your eyes drawn to the centre of this swirling mass to, the vortex of murky water. The rumbling noise together with the gurgling of the water was now equally menacing. I began trying to rationalise what was happening before my eyes, but because of the complete uncertainty here as well, it gave me an intense feeling of fear: fear of the unknown. After a few minutes, there seemed to be a slight lull in the power of the swirling water. The water level dropped by several centimetres and the diameter of the vortex reduced to about half its original size. The noise level also dropped slightly, but within a matter of five seconds or so, the whirlpool kick in again instantly swelling the water level and the roaring noise increased. The vortex opened up fully once more sucking the water into the ground again. As the level swelled there was turbulence in the water with loads of eddies swirling around and masses of air bubbles coming to the surface. There is no indication how deep this pool actually is and adrenalin kicks in as once again more uncertainty gives an intense feeling of fear and unease. Part of me wanted to step away, but curiosity kept me there. I was, however, thankful there was a barrier in place. Walking around Descension, this cycle continues time and time again, and then I realised there was a real paradox here. 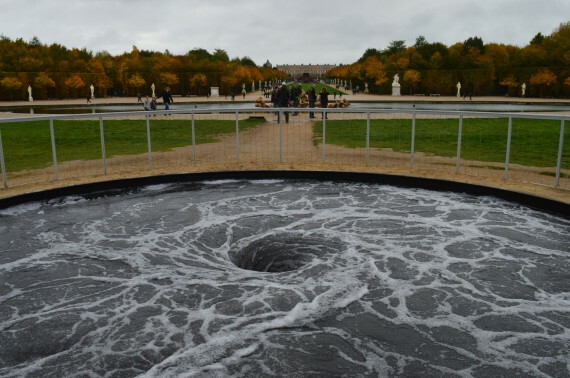 Here I am in the stunningly beautiful grounds of the equally beautiful Château de Versailles staring into the menacing and powerful vortex of water, forgetting the fact that it is an art installation. It was an amazing experience with such a mix of emotions and sensations. 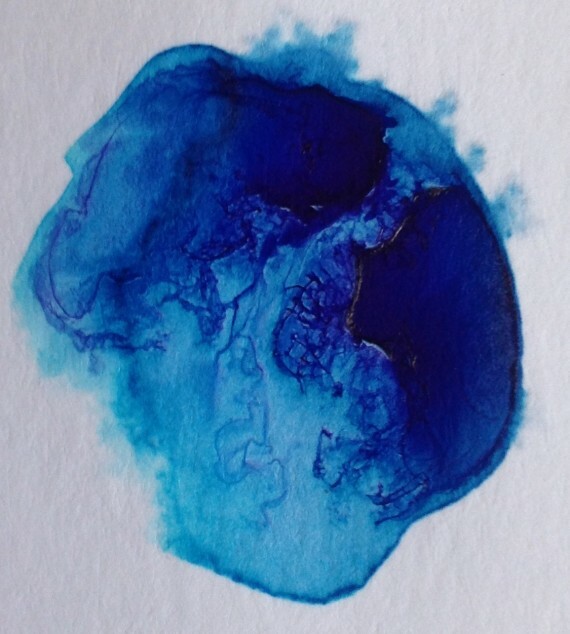 As with Dark Brother by Kapoor and James Turrell’s St Elmo’s Breath and Skyspace – Seldom Seen, Descension has to be experienced in the flesh to be able to have any appreciation of it. 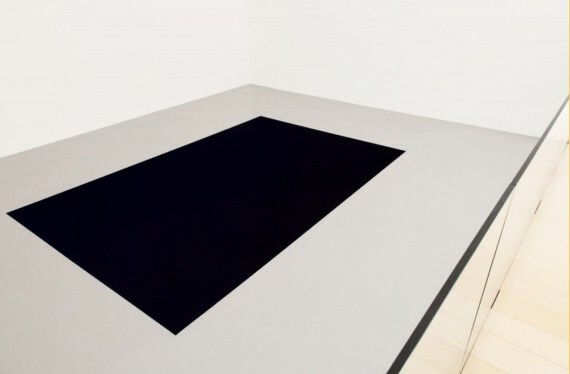 It is evident here that art can induce a diverse and extreme range of feelings and emotions from the menacing fear in Kapoor’s work, to the tranquil, other worldliness of Turrell’s installations. Dark Brother by Anish Kapoor (2005) Foto © Amedeo Benestante. While in Naples I visited the contemporary art gallery MADRE Museo d’Art Contemporanea Donnaregina Napoli. There was no exhibition catalogue available and having not checked online previously, I had no idea what works of art were on display. It was a real pleasure therefore, to see a whole range of site specific art installations. All the more rewarding because this is my area of interest in art practice. To be presented with works by artists such as Richard Serra, Rebecca Horn, Sol Le Witt and many more, this was an incredible find. However, to my utter disbelief and immense joy as I was about to leave one installation room, I caught site of the corner of the artwork in the next room and quite literally the hairs on the back of my neck stood up. I immediately realised this next piece was by Anish Kapoor. Not only that, but an artwork that was pertinent to my dissertation. As with James Turrell’s St Elmo’s Breath that I’d seen only two months earlier in his Lightspace exhibition at Houghton Hall in Norfolk, I was about to ‘experience’ at first hand Anish Kapoor’s Dark Brother. Walking into the white walled gallery space, at first sight Dark Brother appears to be a black rectangle on the light grey floor and measuring approx 3 x 5 metres. Then there’s a sudden realisation. There are no signs or hints of reflections or marks on the surface of any kind. I started to feel rather uncomfortable because I wasn’t at all sure whether this was a black rectangle on the floor, or a hole in the floor. I then started to look for hints of highlights that might give clues to the sides or even corners of this rectangular box that must be in the floor, but there are none! This rectangular shape gave no hint other than being pure black and emanating not one ray of light. It’s not making sense because when I moved position slightly to another viewpoint nothing changes. It still appears an intense black. Emotions now begin to turn from the initial feeling of immense joy to an intense fear! My heart rate begins to rise as all the information my brain is receiving is telling me I am looking into a ‘black hole’, an apparently very deep space with no signs of sides or bottom. This is a very strange and overwhelming feeling having walked into an art gallery in the city of Naples you stand two metres away with only a metre high glass barrier between you and what appears to be a bottomless pit. Nothingness! I begin to feel very uneasy and my heart rate rises still further! Logic dictates it is an optical illusion because here I am standing in a gallery in Naples and so there can be no ‘bottomless pit’. However, what my eyes are seeing and my brain is telling is that I’m stood two metres away from a ‘black hole’! There’s something of a conflict now between my perception and my rationality. Moving on to next room having spent the last 20 minutes or so trying to make sense of what I was experiencing, even witnessing, left me feeling a mixture of extreme fear, excitement, confusion and intrigue. All the other works of art in the exhibition seem to pale into insignificance, because they didn’t impart the extreme range of feelings and emotions as Kapoor’s Dark Brother. This whole experience was made all the more amazing because I wanted to be able to see, and ‘experience’ a Kapoor artwork that deals with perceived space as part of the research material for my dissertation. Having searched for potential current exhibitions of Kapoor’s work and had no success, I feel incredibly fortunate. One thing is patently obvious though. Artworks such as Dark Brother have to be experienced and not just looked at in photographs. They cannot be appreciated in any other way other than experiencing them.